Drennan Pole master carp bungee is a tubular twin walled pole elastic with a hollow core and is available in 5 diameters. Pink 2.5mm 14 to 16. Red 2.9mm 18 to 20. Winder bungs comes in mini, small, medium, large. The Drennan BOBBER float is ideal for riffles and shallow water and when using a small jig as bait. The float is clear for a subtle presentation. This heavy duty float is great for large, deep rivers. The Drennan PIKER can be fished as a fixed or slip float. The stocky Drennan ZEPPLER is ideal in deep water and is stable through rapids. It can be fished as a fixed or slip float. New Drennan series 7 rods 6 in the range starting with. The Drennan puddle chucker carp feeder rod again offers unbeatable value for money. This is a 2 piece rod available in either 10' or 11' lengths. Now also available 12' method feeder. 11' Puddle CHUCKER FEEDER £79.99. With ideal reel lines between 4lb & 7lb this rod is a really versatile all rounder. it will cast anything from bombs to big feeders and allow you to do so with accuracy and confidence. The three all glass quiver tips at 1 1/2oz, 2oz and 3oz give a softer more prolonged bite indication which is ideal for still water fishing in general and carp in particular. The special shock absorber through action is designed to reduce hook pulls and help to subdue bigger hard fighting fish quickly and efficiently. 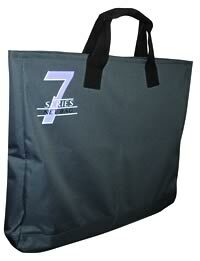 Comes Supplied FOC in the all new Padded sleeve that has the Series Seven logo printed on the outside. The Drennan Series 7 method feeder combo rod can be fished at either 10ft or 11ft 6 inches. Method feeder fishing is a highly effective system which usually results in vicious takes from carp. This requires a softer rod with a semi through action to help avoid breaks and hook pulls. This combination rod has all these characteristics and is superb at either 10ft or 11ft 6". It is ideal for all short to medium range carp fishing. It is supplied with 3 slow taper glass tips of 1.5oz, 2oz and 3oz. 11' Puddle CHUCKER CARP waggler £64.99. suit a wide variety of applications in particular pellet float fishing. This is a 2 piece rod. 12' Puddle CHUCKER CARP waggler £79.99. 12' Puddle CHUCKER POWER CARP float £79.99. A seriously powerful float rod which still retains excellent balance and feel. Combined sensitivity with the progressive fish playing action, helps avoid hook pulls around the net when playing hard fighting carp. Ideal reel lines from 3lb-7lb and for everything from standard waggler's to long range casting loaded missiles. These rods are of exceptional quality that we;ve come to expect from the Drennan stable. 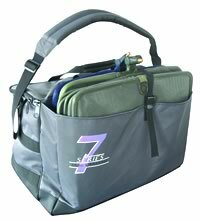 New Drennan series 7 luggage the flagship of the Drennan range.